Recent research has demonstrated the benefits of active networks: customized network services can easily be built and modified, packet streams can be processed inside the network, etc. 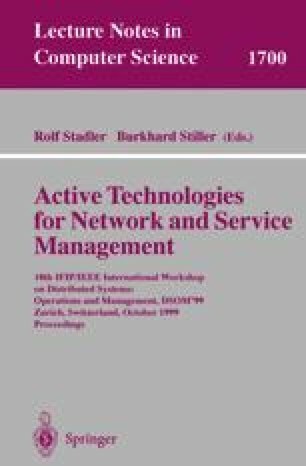 This paper addresses the question how the benefits of active networking can be exploited in a telecom environment, where a large number of customers must share a common network infrastructure. We introduce a framework that allows customers to deploy and manage their own active services in a provider domain. The key concept in this framework is the Virtual Active Network (VAN). A VAN is a generic service, offered by the provider to the customer. From the customer’s point of view, a VAN represents an environment on which the customer can install, run and manage active network services, without further interaction with the provider. From the provider’s perspective, the VAN serves as the entity for partitioning the provider’s resources and isolating customers from one another in virtual environments. We describe how the VAN concept, VAN management, and customer service management is realized on ANET, an active networking testbed.